Players of any handicap level can cut more strokes from their handicap more quickly with the simple to understand and implement strategies in Subconscious Golf. 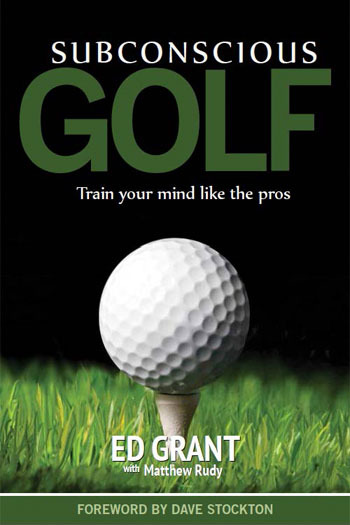 Golf Digest Top 50 Teachers like Dave Stockton, Jim McLean and Tim Mahoney credit Ed Grant and Subconscious Golf for influencing their own teaching of the mental game, and they have incorporated Ed's techniques into the day-to-day lessons they give. Players at every level have used Ed's techniques to win tournaments and lower handicaps—from major champions to state amateur champions to club champions and flight winners. Ed teaches these concepts as a fellow golfer, in a way that is easy to understand and apply no matter your skill level. Many recreational players dismiss mental game strategies and instruction as only appropriate for low handicap players. In reality, players of any handicap level can cut more strokes from their handicap more quickly with the simple to understand and implement strategies in Subconscious Golf. Ed has used the concepts himself to improve from a self-taught player who first picked up clubs as a college student to top rank amateur player with club, local and regional tournament victories to his credit. Ed first introduced these concepts in the 1970’s through seminars he led for the PGA of America, the National Golf Foundation and PGA Sections all across the U.S. The original Subconscious Golf program was a series of eight cassette tapes recorded at those seminars—where he shared the stage with teaching legends like Wiren and Bob Toski. Consistent demand for the material prompted two small revisions and a release on CDs in the 1990s. In 2012, Ed undertook a comprehensive expansion and revision of the material with the help of Golf Digest Senior Writer Matthew Rudy, who has ghostwritten books and articles with players and teachers like Phil Mickelson, Ernie Els, Dave Stockton, Hank Haney and Stan Utley. This newest version of Subconscious Golf includes volumes of new material in the form of a 160-page instruction book, and a set of high definition instruction videos designed to accompany and expand upon the text. The videos feature Ed and Golf Digest Top 50 Instructor Tim Mahoney, who works with more than a dozen tour players from his base in Scottsdale—and is also Ed’s personal instructor. For more information on Subconscious Golf, including testimonials from many more teachers and Tour players, visit subconsciousgolf.com.